The push for unisex uniforms is moving forward and led from the top — Navy Secretary Ray Mabus. 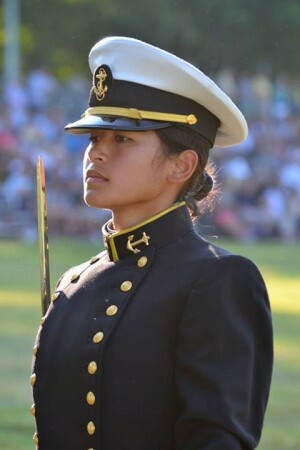 Mabus believes it’s time for female sailors — and Marines — to wear the same uniforms as their shipmates so as to better blend into today’s Navy, where women serve in fleet units and shouldn’t wear different covers and uniforms in formation. Intended as a step to reduce discrimination against females in the Navy, the effort could also spell big changes for your seabag. For exclusive details about the proposals, reactions of sailors who participated in the wear test, and what these changes will mean for you, pick up a copy of Navy Times on newsstands Monday, or check NavyTimes.com early next week. Mabus weighs in on common covers in the following video, at the 3:07 mark. I completely agree with SECNAV on this. I also believe that officers should wear the same uniform as enlisted except for collar insignia devices and covers. Since we are about equalizing standards, perhaps women should have to finally meet the same PRT standards as men. And how about they sign waivers that if they get pregnant at a sea command, they will be expelled from the service? Men can’t get pregnant and get reassigned to shore duty. Equality means we are equal, yes? I am female and served as a Naval Officer for four years. The whole idea of a genderless Navy is ridiculous. Men and women are not equal. Womenare smaller, weaker, and they get pregnant. They aren’t inferior, just different. Putting them in the same uniform won’t make them the same. I find the idea of a genderless Navy extremely offensive. Furthermore, women should not be allowed in combat. Women in combat will get pregnant and then we will have pregnant women on the front lines. I totally agree with what Alexandra wrote. Genderless? Sure, that means men sit to piss, where a tampon for 6 days a month, shave their legs and armpits, and give up the remote control. Going genderless isn’t going to work. Do we get genderless showers and berthings, too (i.e. Starship Troopers)? There is no point to going genderless one way and not finish the journey. Genderless becomes nothing more than a misnomer otherwise. The uniforms may matter little in the long run, but there are still too many social and ideological issues in today’s world to have anything aside from clothing be genderless. This is silly. Women have different body shapes, why should females be forced into uniforms that won’t fit them? Men (who are in shape) are shaped like a V, women either have straight lines or their waist cuts in to cut back out. Joe, what about the men who get a girl pregnant at sea? Ought they also not be kicked out for making government property unusable in a sea command. It takes two after all. Alexandra said it best , I could not have worded it better. Totally agree with Alexandra. We ARE different but NOT inferior. Might as well, you have successfully, eliminated all the other NAVY Traditions Iam extremely pround to say I was part of USN 1971 TO 1993. This is just another silly snafu for Mabus. What a moron. Do not change the mens uniform to be unisex. Men need more room in the pants and women need more up top. It would look silly. Please give Sailors the proper respect by capitalizing the word in your article. Thank you and have a great day. Women want equal opportunity and equal protection under the law, not just to look like their brothers in arms. sexual bias and harassment is rampant in the services. Changing the milieu that enables such behavior is the REAL leadership issue. I can’t print at work because I might waste paper and now we’re pushing to make everyone wear the same silly hat? Our priorities are wrong here. Making women look like men will not hide your problems, Mr. Mabus. I am actually for this. With all these Navy tradidtions going away, I am so glad the crackerjacks could be too! I will always be the first to say that I did not join the Navy for the dress uniform. I don’t think they make us look sharp at all…they even did a skit on SNL where a little boy was wearing dress whites for his halloween and the adults asked him if he was dressed up as some homosexual. Now I’m not homophobic…but I honestly do not think our dress uniforms do justice for our Navy. My opinion….if we’re getting rid of some of our traditions…..please get rid of our dress crackerjacks! Maybe this new uniform proposal will be a great thing. We have a unisex uniform. Those stupid blue cammies that the navy paid billions for. Why do we continue to re-invent the wheel every three years? What a dumb idea!